Sale Sharks secured their first away win of the season when they beat London Wasps 30-33 in the Anglo Welsh LV Cup and ended the home side’s unbeaten run this season. The victory means that Sale Sharks are in the Anglo Welsh LV Cup Semi-finals. 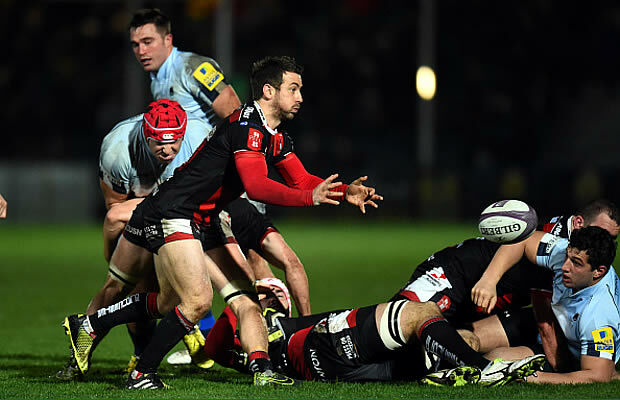 Former England fly half Danny Cipriani scored one of five tries for the visitors, with Kearnan Myall, Tommy Taylor, Sam Tuitupou and a penalty try contributing to the victory. Wasps scored three tries of their own through new signing Charlie Hayter, Charlie Davies and number eight Sam Jones in an ill-tempered game that saw Will Taylor and Davies sin-binned for the hosts and Aston Croall for the visitors. “Any win that gets us to a home semi-final is going to be good for our confidence and we need all the confidence that we can get to be honest,” said Sale boss Steve Diamond. “We’re rock-bottom of the Premiership and we’ve got to get off that. London Wasps: 15 Tommy Bell, 14 Jack Wallace, 13 Jonah Holmes, 12 Charlie Hayter, 11 Tom Varndell, 10 Stephen Jones, 9 Charlie Davies, 8 Sam Jones (c), 7 Matt Everard, 6 Tinus Du Plessis, 5 Marco Wentzel, 4 James Cannon, 3 Will Taylor, 2 Nathan Morris, 1 Zak Taulafo. Replacements: 16 Tom Lindsay, 17 Simon McIntyre, 18 Harry Williams, 19 Will Rowlands, 20 Jonathan Poff, 21 Stuart Commins, 22 Will Robinson, 23 Chris Bell. Sale Sharks : 15 Cameron Shepherd, 14 Rob Miller, 13 Jonny Leota, 12 Sammy Tuitupou Captain, 11 Charlie Amesbury, 10 Danny Cipriani, 9 Dwayne Peel, 8 James Gaskell, 7 Dan Braid, 6 James Doyle, 5 Kearnan Myall, 4 Tom Holmes, 3 Henry Thomas, 2 Tommy Taylor, 1 Ross Harrison. Replacements: 16 Marc Jones, 17 Aston Croall, 18 Tony Buckley, 19 Tom Cruse, 20 Billy Emerson, 21 Will Cliff, 22 Jordan Davies, 23 Charlie Ingall.